The wooden partition walls are made in most cases in melamine or laminate although it is possible to realize such panels with wood veneer. Blind panels are available with different types of structures. 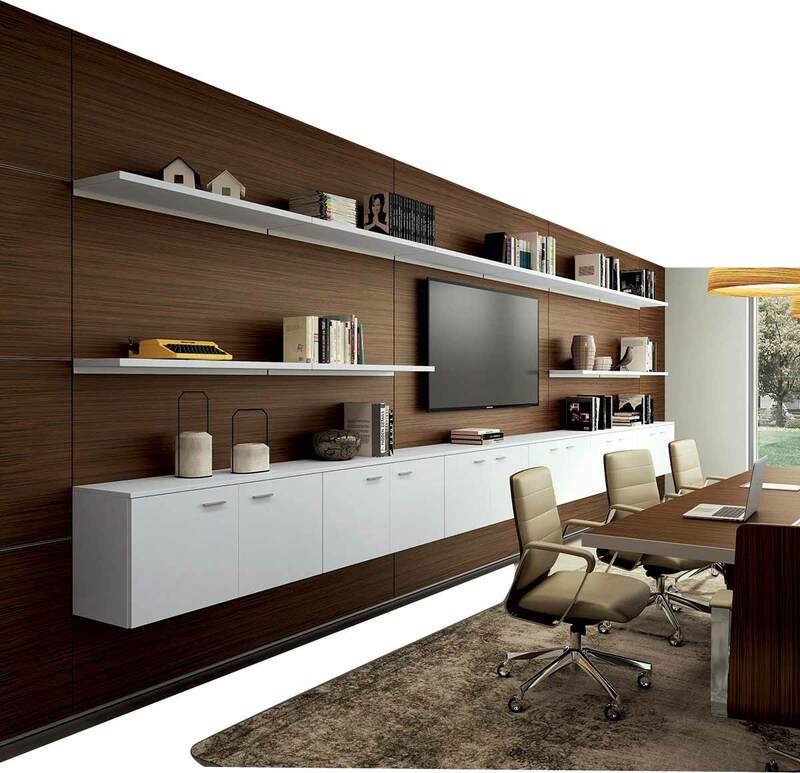 Picture above: you can appreciate the possibility of coordinating the finishing of the partition wall with the furnishings: Conference table and wall are made of the same material. This effect can be achieved even if a partition wall is not needed because such panels can be fixed to a wall and thus be used as wall coverings. 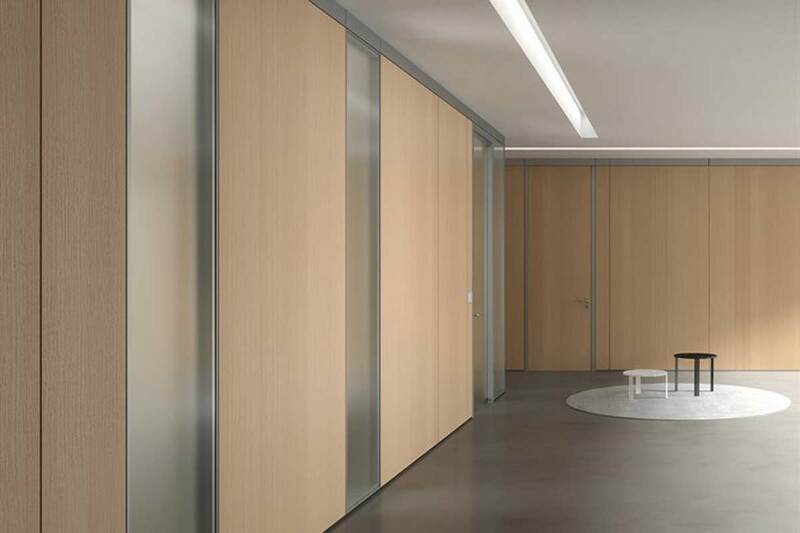 Example of a melamine partition wall with full height vertical panels on the right, wooden panels with the insertion of glass panels on the left. This solution is often used to favor and profit by sunlight. The Frames that provide 02 plugging modules are called shell and are obviously more expensive than the one-piece panels, which provide a single two-sided panel. The shell panels, however, offer greater sound absorption, greater transitability of cables and systems, a better inspectability and greater resistance to impacts and loads. Wooden partition walls with storage units. suitable for those who need to store a lot of paper.. Surely this was the most sold type of wall before 2000, where the need for paper filing was a common problem. the advent of the digital age has drastically diminished the need for fully equipped walls with shelves, shelves, drawers, file holders and cabinets with doors. But for those who still need to store, this is the best way to exploit space and divide the rooms. Operational office on the left, directional area on the right. The wooden and glass partitions help break up the monotony of the blind panels: they retain all the functional advantages, enrich it and illuminate it with glass. The partitions with the use of different materials can help to present your company. Wood / glass partitions with storage units. A look at the storage solutions. Partition walls with storage, large document holding capacity, tidy environment, mix appeal with panels and sliding glass doors. Look at other solutions for partition whit stroge units. Take a look at the glass walls, you can let the light pass and stop the prying eyes.